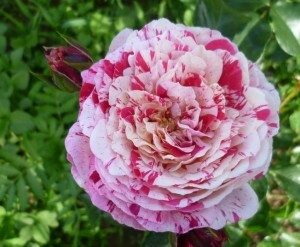 Glossy, dark green foliage striking blooms which are randomly striped and splashed with red, white and cream. Height is around 90cm, pleasant fragrance. NEW 2019 This is a really striking rose and a certain talking point in the garden. Blooms are striped and splashed with yellows, reds and whites and no two flowers are the same. Slightly scented and with few thorns, this floribunda reaches a height of 75cm to 90cm. Foliage is mid-green and glossy. Bred by W. Kordes of Germany.